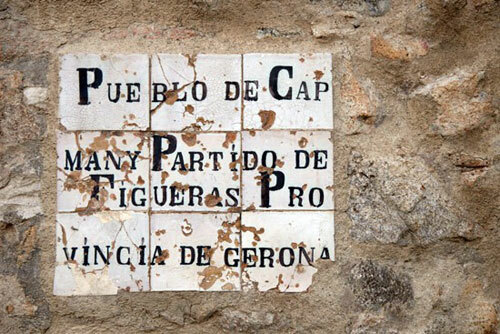 Capmany (the ‘ny’ is just like an ñ and is not ‘many’) is your typical village up in the northeastern reaches of Catalonia. You wind along some twisty road in the hills and suddenly you see the church spire, shortly followed by the rest of the town. The roofs are red. The walls are brown. Everything about the village fits in with the hills from which is emerges. We experienced something quite similar when visiting Cantallops previously. It’s hard to really say what there is to see in these villages because rarely is there any one site that is a must-see. Instead, it’s the charm of the village that is alluring above all else. Capmany is no different. There are nice little restaurants and a miniature church in the middle of town. Or, a public fountain that has excellent spring water when there is enough rain to make it flow. There are also a number of guesthouses for people (most of which seem to be French) to stay at who are looking for the slow life of the village. More than anything else in Capmany though is the fact that there is a lot of wine in the area. There are upwards of 10 official wineries in town; probably more than you can cover in a one day visit. One that stood out was Celler Arché Pagès. In short, they make good wine up in Capmany. It admittedly adds to the overall charm of the place if you can get drunk on the local alcohol.